With the Five of Cups, Tarot – Minor Arcana, difficulties and loss are to be faced. 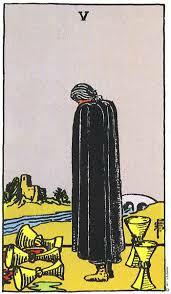 In this card we see a dark cloaked figure with bowed head and shoulders hunched, showing grief, sadness and despair. At his/her feet are five cups, three of which have fallen and spilled onto the ground and the other two behind his back remain standing. He does not seem to notice these upstanding cups because he is so focused on the fallen cups instead. Ahead of him/her a river flows between himself and a castle or home in the distance. To the right is a bridge that can lead to the security of the house across the river. Despite the fact that this card has a strong indication of loss and tribulation, there is a positive aspect that must be considered. If you get The Five of Cups, in a tarot reading , you are quickly becoming disillusioned with life and increasingly pessimistic about your future and instead of moving on, you are wallowing in self-pity and regret about what has been lost. Another interpretation for The Five of Cups suggests that you are having trouble letting go of the past and learning from your mistakes. Forgiveness and the ability to recover after emotional loss are necessary. The Castle in the far background sits on a hill surrounded by trees. The Castle or fortress represents security and protection. Far away from its comforting and stabilizing thick walls, the figure appears exposed and vulnerable. He/she may have run from this Castle and all it holds, alienating him/herself from everything. He/she may now regret it and at present cannot think of a way to put it right. In this tarot card interpretation, the Castle may have felt more like a prison than a place of comfort and sanctuary. On the other hand, he/she may have been thrown out, banished or exiled from the Castle because of something he has said or done. One way or another, he/she may feel that the bridges behind were burned or destroyed. This may be exactly what was wanted and intended, to escape, but then again, regret is the feeling. Grief and ending of relationship. Forgiveness is necessary to move on, holding to anger and pain is toxic.